Witness the Kaoko Throttle Lock. In case you are not familiar with the product, it is essentially a bar end, mechanical, cruise control for motorcycle. Tired of a numb throttle hand? Ready to stop and rest your hand after less than an hour in the twisties? Stupid question, huh? Here's the solution, my friends for when the road turns straight, boring, and painful. 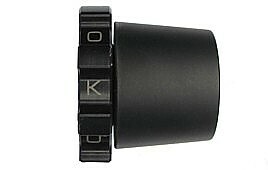 IMHO a Kaoko Throttle Lock is the most important and useful accessory you can add to your sport bike. I have one on all my bikes. 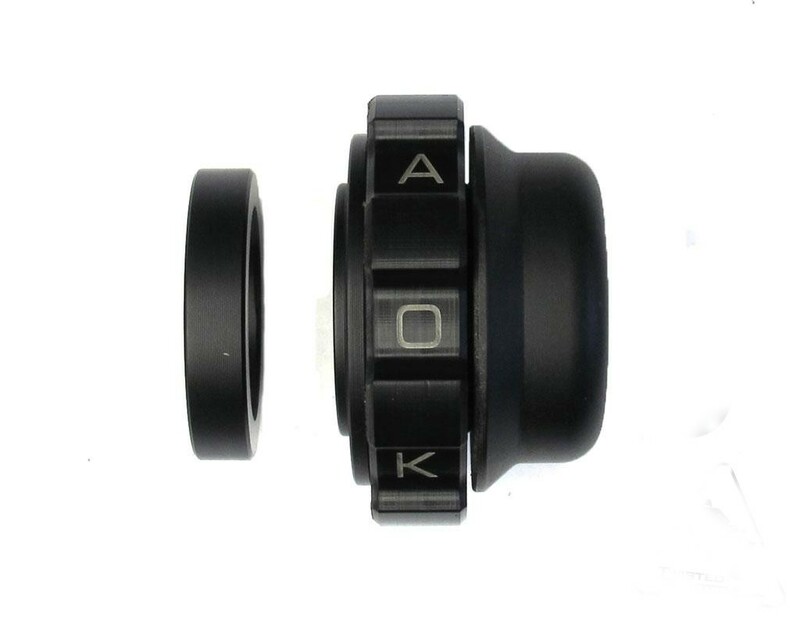 The South African-made Kaoko Throttle Lock comes in black only and is compatible with heated grips. Unlike Throttlemiester throttle lock kits (which are no longer available) the Kaoko kit does NOT include a replacement left-side bar end weight. It installs on the right hand side only. Install is chimp-easy*. Just remove the right hand bar weight, replace it with Kaoko's bar weight, and firmly tighten the bar end bolt. Bam.. Done. * Chimp not included. The Kaoko Throttle Lock kit for BMW will fit the following bikes-- 2009-2015 BMW K1300R, 2009-2016 BMW K1300S, 2005-2008 BMW K1200R, 2005-2008 BMW K1200S, 2010-2018 BMW R1200RT, 2015-2019 BMW R1200RS/R1250RS, 2006-2014 BMW R1200R, 2006-2008 BMW R1200S, 2013-2017 BMW F700GS without OEM handguards or with Barkbusters or Touratech handguards, 2013-2017 BMW F800GS without OEM handguards or with Barkbusters or Touratech handguards, 2014-2016 BMW F800GSA with or without OEM plastic hanguards or with Barkbuster handguards. Note: Does not fit the K1200RS. The Kaoko listed below for Kawasaki (which looks like this) will fit the following bikes: 2008-2018 Kawasaki GTR1400 Concours, 2000-2006 Kawasaki Ninja ZX12, 2006-2018, Kawasaki Ninja ZX14 / R, 2006-2016 Kawasaki ZZR1400, and many others..
Aftermarket Bars & Grips Compatibility: Kaoko Throttle Locks are compatible with most, but not all aftermarket bar risers. Let us know before you order and we'll check for you. Also.. Some aftermarket grips may need to be trimmed. Warning!!! 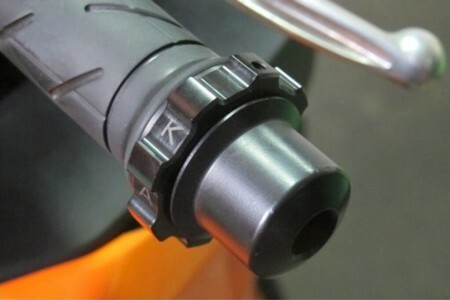 As with any part or accessory on a motorcycle, improper installation and/or use of the Kaoko Throttle Lock could cause SERIOUS INJURY or DEATH. Riding a motorcycle is a inherently dangerous activity, and as such should be treated with utmost respect. The Kaoko should never be used by inexperienced riders. Before riding, become acquainted with the operation of the Kaoko. Inform anyone who is going to use your cycle that the Kaoko is installed and how to disengage it. Do not use in traffic. Do not use in a residential or urban area. Do not use in any situation where precise throttle control is needed. Never take your hands off the handlebars. 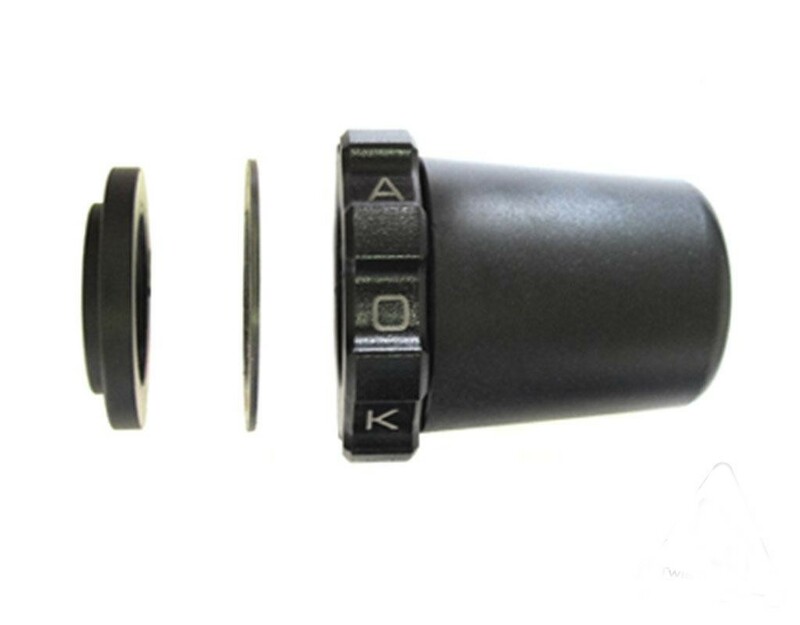 If you have any reservations about using the Kaoko Throttle Lock please return it to us for a full refund.